School reopened for my preschooler in August. With that, all the invitations for birthday parties also started. So the child was pretty upset that his birthday is not coming soon enough. April is way too far and he had some meltdowns when I said he has to wait for 6 more months. When he started repeating the same question again and again, I told him I will make him something special for his 4 and 1/2 birthday. So he started counting down days for that. 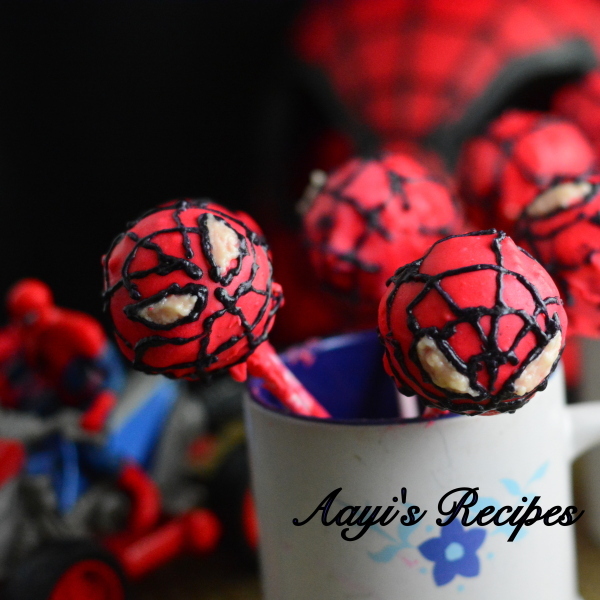 He wanted a big party, so to set the expectations, I told him he will get spiderman cake pops for the special day. (A friend had sent me this Spiderman Candy Apples link, I know he wouldn’t care for candy apples, so I thought of cake pops instead). He gladly agreed. He told me, “I will taste one, if I like, I will take to school and share them with my friends!!”. Lets just say I was really glad that day his school was closed, so I didn’t have to make some 20+ cake pops. 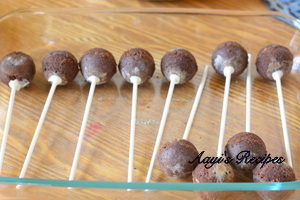 Most of the cake pops I have seen are prepared with crumbling a cake, adding some buttercream to it and then forming balls. I did not want to make that this time since I felt buttercream makes the pops very sweet. My child is not too much into sweets. He eats cakes once in a while, but not too much. He loves chocolates though. 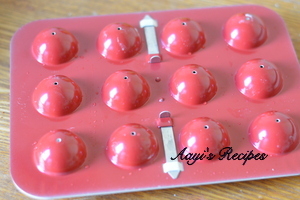 So after a lot of googling, I found out about cake pop pans which I got at Target. 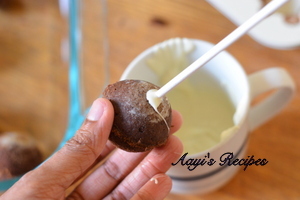 I used eggless chocolate cake recipe for my pops. I used half the quantity which was perfect for the pan. 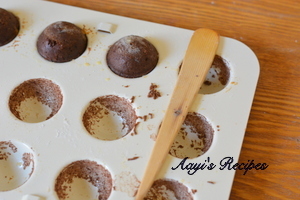 The cake pop pan is greased with butter and sprinkled with flour. 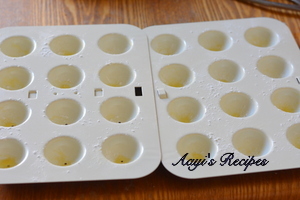 Unlike a muffin pan, each pop mold is filled completely (only one half of the pan) and then the other half is kept on it and locked. So when the cake bakes, it fills up the other half to get perfect rounds. I baked it for 15mins. The I let it rest till it was cooled completely and then removed the pops from pan. 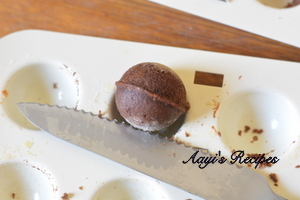 Then with a sharp knife, removed any round rings on the pops that were caused by oozed out cake batter. 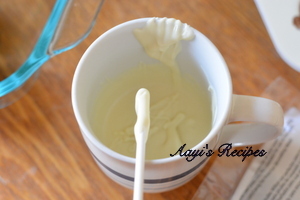 In a cup, I melted some white chocolate chips. 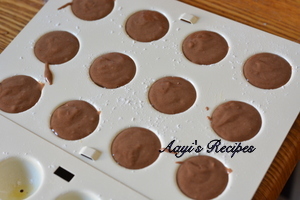 Each pop stick was then dipped into chocolate and inserted into pops. Then chilled in fridge till the chocolate is completely set. Here is where the problems started!. I melted some chocolate and then colored it red. I kept mixing it and it all became mushy. Then I remembered something that I had read somewhere. Do not mix white chocolate too much!. So next batch I was lot more careful. Once the chocolate was melted, I dipped each pop into the colored chocolate. I had to be really careful here since they started falling apart, so I had to move quickly and carefully. Then I refrigerated them back till the chocolate was set. Then I drew eyes with white buttercream and webs with black buttercream.